October is National Bullying Prevention Month! In this month’s ASAT feature, Sunbul Rai, MSc, BCBA, Renee Wozniak, PhD, BCBA-D, and Rachel L. Liebert have collected some amazing resources to address the issue of bullying. To learn more about ASAT, please visit their website at www.asatonline.org. You can also sign up for ASAT’s free newsletter, Science in Autism Treatment, and like them on Facebook! Bullying is an unfortunate reality for many individuals with (and without) autism spectrum disorder (ASD). This list of annotated resources has been created to serve as a helpful reference for individuals with ASD, parents, clinicians, and educators alike. Included are resources that provide realistic strategies around both preventing bullying and addressing existing bullying. We hope that this information will support informed decisions and assist you in taking a strong stand against bullying. 1. National Autism Association (2015). A & S bullying: 5 things parents can do – www.autismsafety.org/bullying-tips.php The National Autism Association (NAA, 2015) provides a brief and practical list of five steps parents can take to address and prevent bullying in school, including 1) preparing the team, 2) addressing bullying with specific goals in the Individualized Education Plan (IEP), 3) preparing your child, 4) monitoring your child for signs of being bullied and 5) using the complaint process. At the outset, the authors stress the need to clarify the school district’s policies on bullying as a first step to prepare the team. Next, NAA suggests politely making it clear that you will be involved in helping the team to avoid your child’s victimization, and clearly communicating with teachers, administrators, the school board, and possibly the child’s peers to provide information on the child’s specific strengths and challenges, autism spectrum disorder, and the problem of bullying. In the IEP, NAA suggests addressing bullying by including social skills and self-advocacy goals, applicable accommodations, a familiarization plan, and specific peer support. To prepare your child, it is suggested to talk to him/her about appropriate friendships and about bullying, obtain social skills training if possible, and to help him/her get organized and oriented to the school in advance. Next, NAA suggests monitoring your child consistently for signs of being bullied by visiting the school often and keeping the lines of communication open with your child and teachers. If the complaint process is necessary, be persistent while avoiding being overly emotional; begin with informal written resolutions, moving to filing a complaint if necessary, while keeping in mind your rights under “The Individualized with Disabilities Education Act” (IDEA, 2004). “A & S Bullying: 5 Things Parents Can Do” is a quick read that may help parents take some simple first steps in addressing and preventing bullying issues for their child. 2. Autism Speaks (2015). Combating bullying – www.autismspeaks.org/family-services/bullying “Combating Bullying” is a compilation of information surrounding bullying of individuals with ASD, incorporating links to a variety of Internet and other resources. Some of the links include the Interactive Autism Network (IAN)’s study on bullying experiences of children on the autism spectrum, a Special Needs Anti-Bullying Toolkit, the trailer for and information on Bully: A Documentary, links to almost 20 books, 10 websites, and to other resources including a DVD and a list of signs to look out for that your child might be being bullied. The compilation addresses bullying of individuals with ASD and Asperger’s Syndrome, and includes information on bullying in schools, cyber bullying, and more. Information may be useful for parents, caregivers, educators, school administrators, individuals with ASD, and peers/friends of individuals with ASD. 3. Autism Intervention Research Network on Behavioral Health (2013) – Remaking Recess www.airbnetwork.org/remaking.asp The Autism Intervention Research Network on Behavioral Health provides access to a booklet on a social skills intervention called “Remaking Recess” for use in the school setting. The booklet provides a treatment overview (helping children with ASD learn to engage with peers in the school setting) and a brief summary of playground engagement states (solitary, onlooker, parallel, parallel aware, joint engagement, games with rules) followed by specific strategies that can be implemented at recess time. Intervention strategies are included for a variety of situations, including 1) transitioning to an engaging activity and setting up, 2) providing popular developmentally-appropriate games and activities, 3) in-vivo social skills instruction, 4) facilitating peer conversations, 5) playing games, 6) sustaining engagement, 6) fading out of an activity and 7) a quick guide to boosting peer engagement. One of the main purposes of the intervention is to prevent bullying by aiming to improve the social inclusion of elementary-aged children with ASD by means of facilitated interactions with peers. “Remaking Recess” may be useful for individuals in educational settings who wish to take proactive steps to reduce bullying. 4. Committee for Children (2015). Second step bullying prevention unit – www.cfchildren.org/second-step/research The Committee for Children is a non-profit organization that uses education with the aim of preventing bullying, child abuse and youth violence. The Second Step Bullying Prevention Unit is an initiative through The Committee for Children and is aimed at reducing bullying and peer victimization. The website includes information on the Second Step Bullying Prevention Unit Program as well as program outcomes. It comprises an article on the role of social-emotional learning (SEL) in bullying prevention efforts and highlights the importance of specific social and emotional skills taught in SEL programs, which include 1) empathy, 2) emotion management, 3) social problem solving, and 4) social competence. The website indicates that the implementation of the Second Step Bullying Prevention Unit can help empower schools to prevent and reduce bullying. It may be useful for professionals and parents alike to help them better understand specific skills that need to be taught to children to help prevent bullying. 5. AbilityPath.org: Support for Parents of Children with Special Needs (2014). Bullying – www.abilitypath.org/areas-of-development/learning–schools/bullying/ AbilityPath.Org provides many bullying resources on its website and one of its highlights is the comprehensive report on bullying which focuses on supporting parents of children with special needs. The report is entitled “Walk a Mile in Their Shoes: Bullying and the Child with Special Needs” and emphasizes the “silent epidemic” of bullying that children with special needs face on a daily basis. 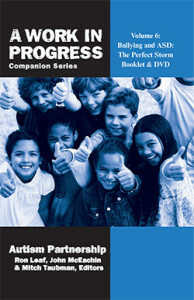 It has several sections, which include: an overview of the report, testimonials from parents and children, targets: children with special needs, statistics, signs of being bullied, cyber bullying, teachable moments, the IEP, the law, the experts, the anti-bully program, and the call to action. Furthermore, it has several parent toolkits along with a teacher toolkit to help caregivers identify signs of bullying, and it highlights proactive steps that can be taken to protect a child with special needs. The information is also geared towards cyber bullying, which is bullying that can be conducted through the use of technology and social media sites. For example, one of the parent toolkits stresses the importance of protecting a child with special needs by teaching the child not to reveal personal information online, limiting online time, reviewing security settings on the computer and so forth. “Walk a Mile in Their Shoes: Bullying and the Child with Special Needs” promotes awareness, provides resources on bullying and its impact, and may be useful for parents, caregivers, teachers, administrators and other professionals working with children with special needs. 6. PBIS: Positive Behavioral Interventions & Supports (2015). Bully prevention in SWPBS – www.pbis.org/school/bully-prevention PBIS: Positive Behavioral Interventions & Supports (2015) provides bully prevention manuals for the elementary, middle, and high school levels. The manuals are meant as a resource for the school setting and aim to provide students with the tools needed to be free of bullying through the use of school-wide positive behavior interventions and supports. The program described in the manual is divided into six lessons and focuses on the “stop/walk/talk procedure” for gossip, inappropriate remarks, and cyber bullying. The stop/walk/talk procedure involves physical and verbal components with examples of when these components can be used appropriately and when they should not be implemented. The manual emphasizes teaching the skill, followed by practice and roleplaying for a variety of scenarios. The lessons are easy to read and are ready for implementation in the classroom setting. PBIS’s bully prevention manuals may be useful for teachers or other educators in school and similar settings. 7. National School Climate Center. (2015). Educating minds and hearts… because the three R’s are not enough – http://schoolclimate.org/ The National School Climate Center is an organization that utilizes relevant research to establish and distribute guidelines to encourage acceptance and safety in schools. The Center offers professional development programs for educators, parents, and after-school supervisors to better understand and promote children’s social and emotional wellness and communication. Their website offers guidelines to help educators and parents establish and maintain safe, comfortable schools and homes by understanding social and emotional learning. The “Bully Prevention” section of the website includes a toolkit entitled “The Breaking the Bully-Victim-Bystander Cycle Tool Kit.” This resource may be useful for educators who wish to create a positive school climate. 8. The Bully Project (2015) – http://www.thebullyproject.com/ The Bully Project is a website that aims to take action against bullying. It focuses on a documentary about children who were bullied during the 2009-2010 academic year and how their parents supported them and modeled “upstander” rather than “bystander” behavior. The website invites users to share their own stories and host or organize screenings of the film to raise awareness. The site also includes tools (including DVDs and toolkits that can be purchased) for students, parents, advocates, and educators, with a section devoted to individuals with special needs. The tools for educators are also available in Spanish. The “Roadmap to Building a Caring and Respectful School Community” includes work that was produced with the assistance of the Making Caring Common Initiative at the Harvard Graduate School of Education. The website also provides interested individuals a platform in which they can take action by joining regional anti-bully project teams. This resource may be useful for those looking to increase awareness and to take steps toward reducing bullying. 9. Pacer’s National Bullying Prevention Center (2015). The end of bullying begins with you – www.pacer.org/bullying/ Pacer’s National Bullying Prevention Center’s website was developed for children and teenagers to be part of a social cause to end bullying. It includes a section dedicated to students with disabilities with legal information and template letters for parents to send to their child’s school to serve as notification of a bullying situation and a written record of having done so. The website also directs children and teenagers to other helpful resources including KidsAgainstBullying.org and TeensAgainstBullying.org. Ample information is provided about National Bullying Prevention Month (October) including a brief history, opportunities to register for events, key points to make should you wish to give a presentation, and directions to request a governor’s proclamation. Educator toolkits are available under the resources tab, and they include classroom toolkits, community toolkits, student-created toolkits, and activities for youth. Additionally, there is a guide for planning school events, and a peer advocacy guide. This website may be useful for children and teenagers who want to make a difference and provides tangible resources to reduce bullying. Rai, S., Wozniak, R. & Liebert, R. L. (2015). Annotated resources: Bullying. Science in Autism Treatment, 12(4), 23-27. Bullying can be complex and the Association for Science in Autism Treatment has other resources available for help with this, as well. Please check out the links below to learn more! Sunbul Rai, M.Sc, is a Board Certified Behavior Analyst® with a background in education and psychology. She has extensive experience working with individuals on the Autism Spectrum in a variety of settings across Canada. Sunbul serves as the Practicum Consultant for the University of New Brunswick’s Autism Intervention Training Program. She is also the founder of the ABA Little Tots Program at Autism Services, the first intensive behavioural intervention (IBI) program in Saskatchewan. She is committed to enhancing the quality of life of individuals with Autism so that they can reach their full and utmost potential. Renee Wozniak, PhD, BCBA-D, joined the ASAT Board of Directors in 2016. Prior to serving as a Board Member, Renée was a part of ASAT’s Externship, where she assumed the roles of Media Watch Co-Coordinator and Media Watch Lead. Renée received her Ph.D. in Special Education, focusing on Autism Spectrum Disorders (ASD) and Applied Behavior Analysis (ABA), from Arizona State University. She has worked in the fields of ASD and ABA in a variety of capacities since 1998, serving in public schools as a special education teacher, behavior intervention teacher specialist and district-wide autism trainer, and in clinical and home-based ABA programs as a research assistant, clinical/behavior interventionist, and program supervisor. Renée has trained families, therapists, teachers, teacher candidates, paraprofessionals, administrators, and others working with individuals with autism, and has instructed master’s level ABA, ASD, research and special education courses. She currently serves in the roles of faculty and subject matter expert in Capella University’s Applied Behavior Analysis program. Renée is passionate about helping individuals with autism and their families by supporting and disseminating scientific research in autism treatment. Rachel Liebert was an extern at ASAT from 2015 to 2016 while she was studying psychology at Barnard College of Columbia University. She is currently a second-year law student at Fordham University and plans to pursue a career in public policy and child welfare. Did you know that October is National Bullying Prevention Month? In an effort to raise awareness around issues of bullying for students with autism, we’re honored to feature this article on preventing bullying of students with ASD by Lori Ernsperger, PhD, BCBA-D, Executive Director of Behavioral Training Resource Center, on some tips and information for parents on protecting their children from disability-based harassment in school. To learn more about ASAT, please visit their website at www.asatonline.org. You can also sign up for ASAT’s free newsletter, Science in Autism Treatment, and like them on Facebook! We have a nine-year old daughter with ASD who started 3rd grade in a new school. She is coming home every day very upset due to other students calling her names and isolating her from social activities. We wanted her to attend the neighborhood school but how can we protect her from bullying? Unfortunately, bullying and disability-based harassment is a common issue for individuals with ASD. As parents, you have a right to insure that the school provides a multitiered framework of protections for your daughter to receive a free appropriate public education (FAPE) in the least restrictive environment and free from disability-based harassment. Start with educating yourself on the current legal requirements and best practices for preventing bullying in schools. Recognizing the startling prevalence rates of bullying for students with ASD is the first step in developing a comprehensive bullying and disability-based harassment program for your daughter. According to the Interactive Autism Network (IAN, 2012), 63% of students with ASD were bullied in schools. An additional report from the Massachusetts Advocates for Children (Ability Path, 2011) surveyed 400 parents of children with ASD and found that nearly 88% reported their child had been bullied in school. According to Dr. Kowalski, a professor at Clemson University, “because of difficulty with social interactions and the inability to read social cues, children with ASD have higher rates of peer rejection and higher frequencies of verbal and physical attacks” (Ability Path, 2011). In addition to recognizing the prevalence of bullying of students with ASD in schools, parents must also recognize the complexities and various forms of bullying. Bullying of students with ASD not only includes direct contact or physical assault but as with your daughter’s experience, it can take milder, more indirect forms such as repeated mild teasing, subtle insults, social exclusion, and the spreading of rumors about other students. All adults must recognize that laughter at another person’s expense is a form of bullying and should be immediately addressed. The Office of Civil Rights (OCR), along with the Office of Special Education and Rehabilitative Services (OSERS), have written guidance letters to all schools to clarify that educational institutions are held legally accountable to provide an educational environment that ensures equal educational opportunities for all students, free of a hostile environment. Any parent can access and print these Dear Colleague Letters and distribute them to school personnel working with their child.